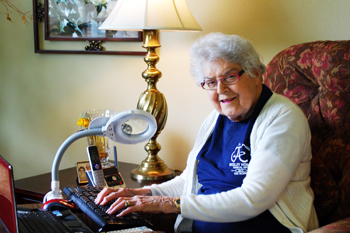 “We were referred to Rightsizing for Seniors by Daystar Retirement Village to assist us in moving our mother. Terry came to the house and thoroughly discussed their services. I was truly amazed at how helpful they were in assisting us to decide what items to move and floor planned her entire apartment prior to the move. Our mom was able to bring much more of her treasures than we had anticipated making her transition so much easier. Not only did they take care of the boxing but they unpacked and completely set up her new apartment, including hanging pictures and drapes. When we were ready, they scheduled their crew to go back to her vacated home, set up tables, sorted the remaining items in the home and scheduled an estate sale. What didn’t sell they gave away, donated or brought to the dump. “I want to tell you again that I am most grateful to you and your helpers for all of the hard work that you guys put into my move from my home in Leschi to my new home here on Queen Anne. After living all those years in my home, I never realized all of the stuff I had accumulated, and that now had to fit into a smaller home. Not only did you gather, box and label all of the things, you were also most helpful in helping me decide what things I really needed in simplifying my life, and transitioning to my new home.